Radiology Mammography International - Fighting Breast Cancer in Underdeveloped Countries. Radiology Mammography International (RMI) is a non-profit organization dedicated to supporting the mammography and breast cancer education needs of developing and underserved regions all around the world: providing technical assistance, equipment donations, hands on training, and community outreach. 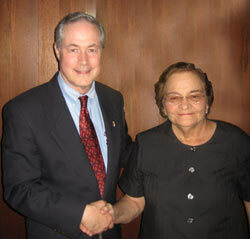 Dr. Richard Hirsh and the First Lady, Lila A. de Bolaños Geyer. 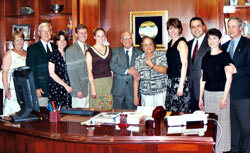 Members of the teaching faculty at the Breast Cancer Conference in the office of the President of Nicaragua. Dr. Richard Hirsh and Margarita Gurdian, the Minister of Health. Sarah Randt, wife of U.S. Ambassador, Clark T. Randt, Jr., luncheon at the residence of the U.S. Ambassador. Community Outreach Team with U.S. 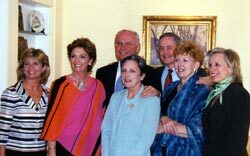 Ambassador James Pardew and wife, Kathy, Stephene Moore, Lynn Hefley, Dr. Richard Hirsh, Kathy Mueller and Betty Ann Tanner. 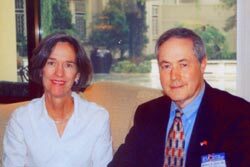 Kathy Pardew, wife of U.S. Ambassador James Pardew, William Healy, Vice President of Breast Imaging Products for Lorad/Hologic and Dr. Hirsh. 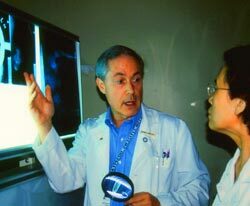 Dr. Richard Hirsh discussing a mammography case with surgeon Dr. Xu Yu Xiu at Beijing University. I just wanted to take a moment and write to you about my experience working with you and the team in Bluefields, Nicaragua May 19-29, 2016. The biggest topic I wanted to point out is the ongoing impact that we had on the people of Nicaragua. Patients come from all over the country to this hospital to be examined and treated. When we arrived, I clearly saw that the departments of radiology, mammography, and the emergency department were not up to the task of properly examining and treating all of those patients. With the equipment and training we provided, we were able to instill in them the knowledge and give their team the tools they needed to properly examine and treat future patients. In addition to this, you helped diagnose multiple cases of cancer, some in which the staff at the hospital probably would not have been able to diagnose without the help of our team. Another area in which I think I personally was able to help the team, but also grow myself, was by interpreting for you. I had never been an interpreter before, and I had to learn a whole new vocabulary of Spanish based in radiology and mammography. I had no idea what I was getting myself into. Looking back on it now, I realize how much I learned. My confidence has grown, and I feel fully capable of doing that job and helping in any Spanish speaking country. I was able to effectively communicate between both groups what needed to be said, and helped the operation run smoothly. I also worked with some other incredible interpreters that helped out when I didn't know a particular word. By the end of the trip, though, I had become accustomed to Nicaraguan Spanish… I had even forgot a lot of English! Lastly, I wanted to point something out that happened in the hospital that I was not expecting. After the staff at the hospital found out that I was an Emergency Medical Technician, they asked me to help teach the medical students and nursing students some emergency medicine techniques. I was able to teach a few classes and show them vital treatments in saving critical patients. Once the emergency room doctors and nurses picked up that I was teaching classes, they came to the class too and they were able to learn some new techniques and perfect the ones they had not yet perfected. I was also able to work in their "ambulance" and in the emergency department and provide treatment to patients. It was great to have such a hands-on experience and be able to use my medical knowledge to teach as well, even if I had no idea I was going to do so before the trip started! In closing, the trip was amazing and we did some pretty incredible things. This trip changed my life for the better, and I see how I can use what I know to go out and help other people in the world. I would love to do something like this again. I want to thank you for this wonderful experience teaching mammography in Amman, Jordan this past April and May, 2010. To be able to give back, using my 30 years of experience, is a lifelong goal realized. And it is because of people like you, that hopefully we can save women, of all countries, from losing their lives to breast cancer! I can't put into words what a joy it was to participate on this project with you and the rest of the brilliant team you put together. I can only hope that I am blessed enough to do it again as part of an RMI team. Once again, thank you! I would like to take this opportunity to thank you for the valuable donation of the mammography machine and ultrasound machine for the Hospital of the City of Bluefields, located in the Atlantic Coast of Nicaragua. These equipments have provided an important tool for the diagnostic and clinical evaluation that this Hospital needed. You can be sure that you contribution and important effort, together to the humanitarian labor of my office make the difference for the health and better assistance to the poor and needy people of my country. God bless you for your support and generosity. I wish to hereby express and extend our deepest thanks and gratitude for the recent donation of valuable mammography equipment and the training given to our technicians. Thanks in the most part to the interest that you have shown in helping our country, our region, and particularly our hospital, today we have the best mammography and ultrasound equipment in the country as well as very well trained personnel. We have assumed a direct commitment together with our local community, with making this a worthy experience and we look forward to having you back again in our city in the near future, as we all join hands in the fight against breast cancer. We wish to also extend our most sincere words of appreciation - through you - to the generosity and human gesture of HOLOGIC, which donated the mammography machine and ultrasound machine given to our hospital. Once again, thank you very much and may God continue to bless and provide for your organization. It was an honor to have you here in our town. In the name of the Consejo Consultivo of Bluefields which I represent, we want to thank you for taking your time to think and share about the necessities, and the work we do for our Hospital. Thank you for your Donation and for giving us the opportunity to have a Mammography machine and training our staff. You all can imagine how our Region needs it, because for us it was a dream that you all have made a reality. Please think how much good you are doing to the entire Caribbean Coast of Nicaragua. We are making the community know who are the ones doing all this for them and we are sure they will thank you over and over. We thank the significant moment that led you here. Never doubt that a small group of persons can change the world, and you all have done it, changing the life of many people. Today a thousand doors of enterprise have been open inviting us to use full work. Thanks to you we have learned that one person can make the difference. The ultimate measure of a person is where he stands at time of challenge and controversy. Forget the time of your distress, I know you had it a lot, but never forget all what you have done for this poor Region, now we have to do the best we can this is our responsibility to show our appreciation . Some of the quotes might give you something to contemplate while others will just make you SMILE. Either way we hope that every time you think of this Hospital you remember the work you did has moved mountains for some people and fulfill their dreams. Thanks for being so human and good heart. You are always going to be in our memories and our hearts. Our home is your home. May the Lord bless you and again thanks, thanks. I am Dr. Laxman Raj Pokhrel doing my residency 3rd year in Radiology in the Institute of Medicine, TU Teaching Hospital, Kathmandu, Nepal. Sir, I hope you are doing fine in there, and I wish you a wonderful summer. I am afraid whether you would be able to recognize me or not but I am a fairly dark guy and if you go through the photos during your latest mission to Nepal with the new mammography unit at the Teaching Hospital in Kathmandu, then you may be able to figure me out. I hope you received the CDs and the greeting card I left for you in Hotel Yak and Yeti before your departure to BP Koirala Memorial Cancer Hospital, Chitwan. Sir, the mammography equipment has been running smoothly with excellent images and there has been a great transformation in our knowledge of interpreting films from your guidance to us during your short visit. Starting from the viewing conditions that you always emphasized upon and I feel I am conscious about it nowadays......Thank you for your untiring efforts to make us learn better and be more rational. Sir, I am sorry for my delay in communication with you and the RMI. I thought of writing to you to remind that we have benefited significantly from your visit and I wish all the best for your forthcoming missions and strongly feel that we would need such missions to make us aware of what we we doing and the way we do things. I know you are a very busy person with so many missions abroad. I frequently visit the web site of RMI and I know your contribution and dedication in this field. The CDs of your presentations are quite beneficial. Lately, I also happened to meet Dr. Janardan Subedi in Kathmandu and had inquired about you and the team. Lastly thank you for all you did and your dedication to make us learn and change. We would love to have you and your team back to teach us again........I am planning to join the BP Koirala Memorial Cancer Hospital, Chitwan; the hospital where you visited after Kathmandu, after I finish up my studies, a year to go! 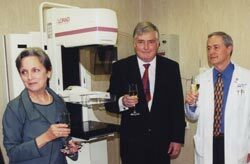 I would like to express my deep gratitude for your collaboration for the donation of two mammography equipment from LORAD, designated for two Bulgarian hospitals; National Oncological Center and Maichin Dom. This generous donation will help thousands of Bulgarian women to fight the cancer. I appreciate highly the training that you and your enthusiastic team provided to the Bulgarian specialists that will work with the mammographs. Thank you once more for your cooperation. I want to let you know personally how much Kathy and I appreciate what you have done for women’s health in Bulgaria. Thank you so much for the preparation and for the extremely successful visit here in May. The time and effort you generously spent in the U.S. and in Bulgaria obtaining mammography machines, training Bulgarian staff and generally promoting Breast Cancer Campaign make a huge contribution to the people of Bulgaria. I have the official title of Ambassador, but it is the direct, unselfish and highly effective efforts like yours which best represent the greatness of our country. I thank you and the Bulgarians thank you. We all hope to see you again soon in Bulgaria. and especially from you for donating the mammography machine for a clinic in Ciudad Jardin and the technical support during the medical training. As the mammography machine was installed, we have been able to improve significantly the Nicaraguan women’s health. We have done a total of 997 mammographies from September 2003 to August 2004, with a monthly average of 93 mammographies. Your visit as well as your professional team has been one of the most relevant scientific events in our country up to now. We accomplished a daily audience of approximately 110 physicians, nurses and medical students during the “primer conference International Sober Cancer de Mama”. This conference had been compiled on a CD and provided to several educational entities in Nicaragua as a contribution for the scientific information. I reiterate my appreciation to you and Radiology Mammography international for your valuable support to us and emphasize on our interest in having a permanent and close links of friendship and collaboration to continue improving the levels of health in Nicaragua. The X ray machine for mammograms donated by RMI to our hospital has been put into use for three years. To better utilize the machine, we invite Dr. Hirsh, chairman of RMI and his team again to give us advice and suggestions in this regard and to lecture us on some advanced technologies and ideas. Three years ago, a team of volunteering radiologist, technicians and other medical service providers led by Dr. Hirsh, chairman of RMI, as well as an expert of radiology, came to China to train our medical staff and lecture us on breast health knowledge. They also donated to our hospital a brand new X ray machine for mammogram worth $1.02 billon. Chinese medical staff members and patients were all deeply moved and impressed by their devotion to work and their meticulousness in scientific study. 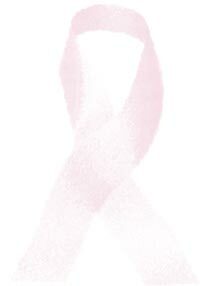 From September, 2001 through June, 2004, the Department of Mammary Disease of our hospital has received a total of 11418 patients, among which 2327 have taken the mammography. Of those 99 whose mammograms show signs of breast cancer, 57 have been finally diagnosed with breast cancer and 10 are still under clinical observation. All those 18 whose mammograms show signs of silt-sized calcification, lumps (clinically untouchable) and gland disorders, etc. have taken X ray needle location biopsy, of which 2 has been diagnosed with breast cancer (0 stage), 2 severe atypical gland hyperplasia, 2 atypical gland hyperplasia, 9 cystic hyperplasia, 2 hyperplasia together with fibroadenoma, and 1 intraductal papilloma. With the help of the machine, the detection of 0 stage breast cancer is 2 or 3 years earlier than clinical exam with hands, which is a priceless contribution to patients’ recovery. Thanks to the guidance and help of Dr. Xu from Peking University Hospital 1, and through three years of study of practice, we have grasped this technology with proficiency, constantly improved our performance in using the machine and making accurate diagnosis, and been able to identify the location of the abnormality in the mammogram with basic accuracy. The skills of needle location biopsy and early clinical detection of 0 stage breast cancer, in particular, have brought us close to the international advanced level. From now on, we will continue with our careful study and experience accumulation taking great efforts to make mammography known and accepted by more and more people and extensively used for people with high risks of catching breast cancer. We are convinced that, the extensive utilization of mammography will generate a constant increase in breast cancer’s early detection and benefit even more women. In addition, encouraged by the hospital leadership, cooperation had been conducted between the breast disease department and the department of pathology, blazing new trails for early identification of a lump’s nature. In terms of breast cancer treatment, last year, we introduced perioperative chemotherapy followed by neoadjuvant therapy, much alleviated 8 cancer patients’ conditions, of which, one’s illness is completely alleviated pathologically. To follow the development in breast health studies, we’ve made our attempt on sentinel lymph node biopsy and have achieved initial success. We are deeply convinced that, thanks to the fast developing medical scientific studies and the hardworking staff of our hospital, we will score even greater advancement in breast cancer detection and treatment. “It was very pleasant to hear the news that a group of U.S. Citizens were going to visit our hospital with the purpose of helping us in the field of prophylaxis, diagnosis and treatment of patients suffering from breast cancer. The gratitude was greater when we met you personally and were able to perceive your kindness and willingness to help that you showed in offering your cooperation in this noble task. or e-mail him click here.